As we leave summer and head into fall, we don't want to lose our sun-kissed glow. So, beauty expert Dayle Haddon shows The Early Show viewers her tricks for applying the right kind of blush to give women a healthy glow. As most women know, blush (or rouge) is one of the most important types of cosmetics to wear. Not only does it add color to the face but applying it the correct way can make women look better and younger. Haddon talked about the different types of blush that are available — from traditional powder to liquid stains — and demonstrated application techniques on models. Haddon says blush is supposed to mimic health and look natural, not look like makeup. One of the most common beauty mistakes is the misapplication of blush. When applied properly, blush can take years off a woman's appearance, she said. Different textures give different results and are appropriate for different skin types and tones. The main categories are powder, cream and gel/stain. Suntan shades can be achieved with bronzer, which is great for darker skin tones as well. Haddon recommends women use a good blush brush. It should be full and soft, like a powder brush (largest brush), only smaller. Swirl brush around in powder. Smile to see where apples of your cheeks are - that's where you naturally flush, so that's where blush should be applied. 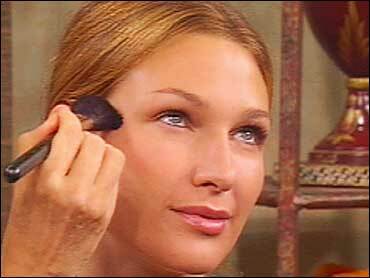 Apply blush in circular motion on apples of cheeks, sweeping outward in a circular motion, blending edges. If you can see edges, you haven't blended enough. Blend carefully and gently with brush or take a cotton ball and blend along edges until edges disappear. Side note: With brushes, there are synthetic and animal hair types. Synthetic is more hygienic. Make sure you wash your brush at least once a month in mild soap or baby shampoo. Makeup artists favor these products because the look is very natural and sheer. They are the best option for natural-looking flushed cheeks. They are best for even skin tones since they can stain and they may accentuate blotchiness in uneven skin. Many are multi-purpose, and can be used on lips as well. In addition to tawny, brown shades, the vibrant, bohemian-inspired shades are also in style this season. Purple is in vogue as well. Many of the gels and tints come in purple shades. To use properly, the process is the same as with creams except that you must blend more quickly with some stains. Wash finger with soap and water immediately afterwards. Stains come off with makeup remover. Tarte Cheek Stain: This is a favorite of makeup artists. Stain literally stains your skin, so you must blend in quickly and wash finger with soap immediately afterwards. Clinique Gel Blush: Works like flush stick, only comes in a tube as a gel. It blends easily and gives skin a natural glow. Haddon explains that creams are ideal for older skin. They help avoid a dusty look, which can accentuate wrinkles. It can also be good for blotchy or uneven skin because it blends so easily and provides sheer coverage. Haddon recommends that cream blush be applied only to moisturized cheeks. It can be used without foundation for an ultra-natural look. Apply to apples of cheeks with gentle circular movements, working with the heat of your finger to melt and blend it in naturally. Dab, don't stroke, always in a circular motion, being very careful not to pull skin. MAC Cheekhue Cream: Goes on creamy and dries to a smooth finish. Physicians Formula Aquablush: Goes on creamy and dries to a smooth finish. The stick application is used for added control as it goes on cool - very soothing and invigorating. The product comes in Breezy bronze shade to continue that tan look, if that's what you're going for. Stila Convertible Colors: Stila cream comes in a compact that comes in lots of shades. It is light and non-greasy and blends quickly with ease. It can be used on lips, too. Chanel Visage Duo: A Pencil with two exotic shades for blending — one cream, one gel. Haddon says cream stick is smooth going on, then blends to soft finish. Gel gives a hint of color.